If you live in or around Jacksonville, your home is likely connected to a municipal sewer. Every day, your sewer line empties the wastewater from your drain lines into the municipal sewer system, through which the waste travels to a water treatment plant. For wastewater to be effectively drained from your property, you need to be sure that your sewer line is functioning properly. 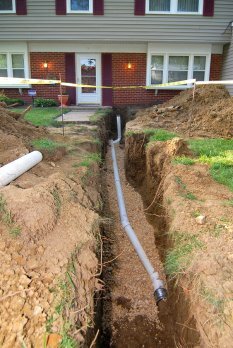 Here are a few signs that you may need sewer line repair from a Jacksonville plumber . If there’s a clog in your sewer line, the water in your system will likely start to back up. Over time, you may detect a foul smell coming from your drains. This means that wastewater is backing up and getting closer to your drains; you should call a sewer repair professional to clean your line as soon as possible. A total blockage isn’t the most common sewer line problem. In fact, it’s more common for sewer lines to be partially blocked up. One way you can tell that your sewer line is partially blocked is if water takes a long time to drain. If water pools around just one drain, it may be an isolated problem; if water pools around all your drains, there’s a problem with the sewer line. A gurgling sound is another huge cause for concern. If there’s a problem with your sewer line, you may hear a gurgling sound coming from your drains when you turn on the washing machine or dishwasher. For the sake of your safety and comfort, consider hiring a plumber to clear your sewer line if you hear any strange noises. If your sewer line issue goes unaddressed, raw sewage will eventually back up through your drains and into your home. It’s important that you watch and listen closely for the other signs of a sewer line problem so it doesn’t progress to this point. If sewage starts backing up into your home, turn off your main water shutoff valve and call a Jacksonville plumber as soon as possible. When you work with an environmentally friendly plumbing company , you will be able to help protect the Earth while ensuring that your home plumbing system is operating at peak efficiency. The master plumbers at an environmentally friendly plumbing repair company will help you reduce your water consumption and overall energy consumption. To improve the environmental impact of your home, a green plumber can install high efficiency fixtures in your kitchen and bathroom. With low flow fixtures, your household will be able to cut back on its daily water use. In addition, a green plumber can also offer you a variety of other services, including drain line installations and more. An eco-friendly plumber will also keep harsh chemicals and other toxic substances out of your home drains. By going green when you choose a plumber located in Jacksonville, you will feel great knowing that your plumbing repair services are also helping the environment. Your water heater provides hot water for all of your daily household activities, including dishwashing, showers, and more. If your water heater breaks down, your household could be left without hot water until your plumber is able to visit your home. To reduce your chances of being caught without hot water at home, it is a great idea to schedule water heater repairs at regular intervals. With routine water heater repair in Jacksonville , you will ensure that your appliance is in peak working condition. To help you determine when its time to call the plumber, here is a look at some of the top signs that it you need to schedule a water heater repair service. One of the top signs that your water heater needs repairs is a lack of hot water in your home. If your water heater is failing to heat water altogether, this is a sign of a serious problem with your appliance. Your water heater may have an electrical issue, or could be in need of a total replacement. If the water coming from your hot water tap is dirty or discolored, this is an indication that you are in need of water heater repairs. When your water heater is failing, the tank may deposit minerals or dirt into your hot water. At the first indication of dirty hot water, you should be sure to contact your plumber right away. When your water heater is about to break, you may hear some strange sounds coming from the appliance. While some sounds are part of your water heater’s normal operation, other loud or abrasive noises could indicate a maintenance issue. If you hear loud cracks, bangs, or pops coming from your water heater, do not hesitate to contact your local plumbing company to set up a water heater repair appointment. When your home is in need of plumbing repair services, it is important to find a reputable company that has a great reputation in the local community. By researching the credentials and ratings of a plumbing repair company, you can feel great knowing that your home will receive the highest level of service. From drain line installations to water heater repairs and more, your new plumber will be able to maintain your entire home plumbing system. A quality plumber in Jacksonville will ensure that your entire home plumbing system is in fantastic working condition after every service appointment. To learn more about how to find a plumber, watch this video from Howcast. When your home is in need of emergency plumbing repairs, it is important to find a plumber that will provide you with the highest level of services. By taking the time to find a reputable and experienced plumber, you will ensure that your plumbing system is restored to peak working condition. A quality company providing plumbing repair in Jacksonville will work closely with you to ensure that all of your needs are met. From drain line installation services to water heater repairs, an experienced plumber will be able to provide you with a full spectrum of services. If you are seeking out a plumber for your home, here is a look at some tips for choosing a plumbing repair company. When you are considering hiring a plumbing repair company , it is important to research different sources and reviews. You may want to ask your friends and neighbors about their experiences with their plumbers. In addition, you can consult online resources to find reviews and ratings of a specific plumbing company. To hire the right plumber for your home, it is important to consider the services that the company offers. For example, if your water heater is going bad, it is essential to choose a plumber that has experience with water heater installations. By finding a plumber that has the knowledge and expertise to repair your specific issue, you will be able to get the most out of your plumbing repair appointment. As you are considering a plumbing company, be sure to ask plenty of questions. When you are on the phone with a service representative, do not hesitate to ask about the company’s licensing, qualifications, and rates. A reputable and experienced plumbing company will be happy to answer all of your questions about their pricing and credentials.